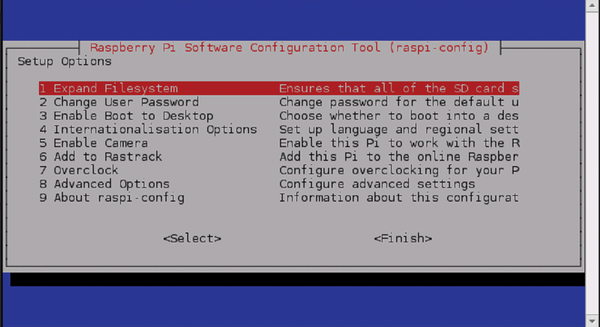 During the first boot, the raspi-config utility comes up automatically, which allows you to configure basic system settings (Figure 3). Select the menu option 1 Expand Filesystem to allow the operating system to access the entire memory on the SD card. The next entry (2 Change User Password) allows you to change the predefined password. Figure 3: The utility program raspi-config starts during the first boot of Raspbian to facilitate initial setup. The entry 3 Enable Boot to Desktop lets you determine whether or not Raspbian should boot into a desktop environment. Because this type of environment is not needed for the envisioned server usage and would merely consume resources, you should select the console option. You may optionally use the entry marked 4 Internationalization Options to adjust the time zone settings and keyboard layout. To be able to reach the router without typing an IP address, you should use 8 Advanced Options to configure the host name – in this example, I have chosen the host name OnionRPG. By selecting Finish and then confirming with Reboot now, you will commit all changes. In this example, I assume that your Raspberry is attached to your network via LAN cable, has obtained an IP address from the router, and is connected to the Internet. Remove the comment symbol (#) in front of the command authoritative; and append the configuration block from Listing 1 to the end of the file. Make sure to adjust the subnet according to your local setting. By pressing Ctrl+O and then Ctrl+X, you save the changes and exit from the editor. In the /etc/default/isc-dhcp-server file, the directive INTERFACES= lets the server know which interface should be used for assigning IP addresses. For the present scenario, enter the value wlan0. Then, assign a static IP address to wlan0 in the file /etc/network/interfaces (Listing 2) and activate it by invoking ifup wlan0. To get the Rasp Pi to function as an access point, the service in the /etc/hostapd/hostapd.conf file needs to be prepared accordingly (Listing 3). The value for wpa_passphrase needs adjusting as well; this is the password for signing into the Wi-Fi network later. To allow Upstart to load the demon automatically, enter the assignment DAEMON_CONF="/etc/hostapd/hostapd.conf" into the /etc/default/hostapd configuration file. To ensure compatibility with the latest Wi-Fi sticks, the developers of Onion Pi additionally recommend an update of Hostapd (Listing 4). After updating the access point software, you can start the two service components by invoking service hostapd start and service isc-dhcp-server start. To load both of them automatically during subsequent system starts, enter the commands update-rc.d hostapd enable and update-rc.d isc-dhcp-server enable. The BPi-R1 is an attractive and affordable combination of switch, access point, and server. We look at how this Banana Pi-based router performs.